Large homes and estates provide a great number of options and opportunities to those who own them, but also a lot of responsibility. Large estates are often marked out by the sheer amount of property the estate covers, meaning acres of lawns, gardens, hardscape, and plants to maintain and care for. Landscape professional services are commonly known as Estate Management that offers comprehensive landscaping care, consultation, and installation year-round. One of these aspects is the idea of seasonal care – the importance of changing landscaping needs to match the seasons and make sure your estate looks its best year-round. Every season provides different needs to your estate grounds. This is known overall as “seasonal grounds management” and covers everything from regular upkeep of the landscape (such trimming and pruning plants and pulling weeds) to getting things ready for the next season (such as cleaning and putting out lawn furniture). Also, things like hardscape maintenance, checking for soil erosion and consulting for problems or the next big landscaping project. It’s important to make the most of each season: each one provides different ways to showcase your home. From seasonal planting so that your grounds always have flowering plants, to getting holiday lighting up for the winter seasons—season displays can help your estate stand out to neighbors and guests alike. From maintaining and clearing annual plants to themed decorations for seasonal parties, these services can help your estate make sure it never has an off season. Lawn care is more than about mowing the lawn (though it is about that too). Different seasons will see different needs for your lawn, from getting it ready for winter hibernation with thatching and dormant seeding to proper fertilization for the spring for optimal growth and color. Likewise, this includes dealing with pests that can damage your lawn, and performing regular maintenance and troubleshooting on your current lawn sprinkler systems, drip lines, and other irrigation. 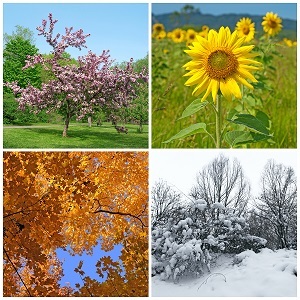 For every season, your plants have different needs for their growth and health. Picking the right fertilizer and mulch for the season can make the difference between struggling plants and lush plant growth throughout the gardens, planters, and grounds. Likewise, using the right mulch can insulate plants against the cold and trap moisture during the hot summertime. When it comes to maintaining your estate throughout the season, it’s important to invest in professional landscapers for your estate management. Here at Greener Horizon, we provide full estate management services, from top level landscape design and master planning, down to the details of plant health care. With a dedicated project manager, you will always have someone to contact about changes to your plan, and who will regularly check on the health of your estate throughout the season. Contact Greener Horizon today to learn more about our landscaping services and season grounds management packages, and request your complimentary consultation today.